Mijas municipality is located on the Costa del Sol in the southern province of Malaga in the region of Andalusia and has a total surface of 149 Km2 and about 77.000 inhabitants. The climate as on most of the Costa del Sol places is milder due its location on the south western part of it, with a yearly average temperature of 18º. It means that it is not too hot in summer or too cold in winter, because of the Costa del Sol micro-climate. The yearly rainfall is less than 600mm and falls mainly between November and April. The municipality borders the Mediterrenean sea and the city of Fuengirola on the south, Benalmádena on the East; Coin, Alhaurin de la Torre and Alhaurin el Grande on the North and Ojén and Marbella on the West. Mijas municipality has 5 main areas: Mijas pueblo on the mountains of Sierra de Mijas, Las Lagunas in Mijas Costa, the coastal places and urbanizations of La Cala, Riviera and Calahonda and it has a coast line of 12 kilometres. Mijas Pueblo is a picturesque so called “Pueblo Blanco” (or white village) and therefore a touristic attraction. It is located at about 8kms from the sea at 400 meters above sea level on the foothills of Sierra de Mijas. Because of its location between Marbella and Malaga it is an easy excursion for every tourist enjoying the Costa del Sol. It is reachable from the coastal road (A-7) or even easier from the toll road (AP-7). Between Mijas Pueblo and Benalmadena Pueblo along the foothills there is an easy to drive idyllic road. Mijas Pueblo was built on a bulged plateau and it was already inhabited since the prehistoric age. Phoenicians, Romans and Moorish left remains of their presence in the area. Along the edges of the plateau surrounding the old village we can find a breathless parkway. Rock climbers are often spotted between the cliffs. Mijas Pueblo is a white washed village with cosy narrow streets and squares. Here you find many restaurants, tapas bars, monuments, museums and curiosities. Aside from this Mijas Pueblo is also a religious sanctuary with a chapel inside a cave. Dozens of tourist buses are daily visiting the village bringing national and international tourists. Fuengirola is totally enclosed by Mijas and is a high density built coastal town with a 7 km beach boulevard along the wide sandy beaches, a harbour and huge shopping facilities and commercial centres like El Corte Inglés and Miramar. Next to the river mouth we can find the hilltop Medieval Castle. Many golf urbanisations were developed and kept expanding during the last decades e.g. La Cala golf (El resort de golf mayor de Europa con 56 hoyos), Miraflores, Riviera del Sol and Calahonda bordering Marbella. 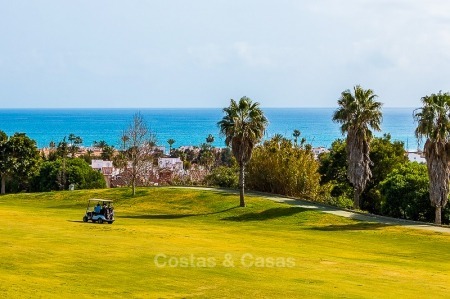 Costas & Casas has access to virtually all luxury properties, exclusive villas and quality apartments for sale in Mijas.